This is a blog I read pretty regularly, and it is always full of good advice and inside tips for aspiring musicians. Find it here. 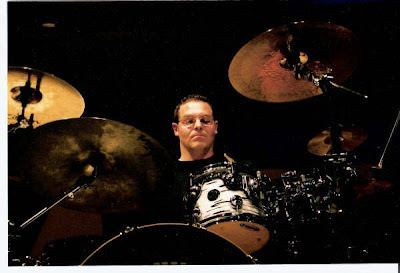 Over the years I have had the opportunity to play on many projects as a session musician. I've played everything from a single suspended cymbal roll (not kidding!) to all of the drum kit and percussion parts for the entire album. Probably my biggest piece of advice is to get comfortable with a very wide selection of styles. Know how to sound like you were born country, or rock, rap, hip hop, etc. Oh, and remember this post? If you're going to play in the studio, get real comfy with chart reading and playing with a click. There are a couple more keyboard* instruments that percussionists are occasionally called on to play. These aren't standard, but they're common enough that you need to be familiar with them. First, crotales. (Cro-tall-ehs) Simply put, they're super-compact, small, pitched cymbals. Again, they're set up like a keyboard, and you usually play them with a hard plastic or phenolic mallet. Seriously, though, you won't play these very often. But even as I type that I have to tell you that all of the orchestral sections I've played with in the last year have used crotales. If you're a band director, and you're thinking about buying a set - borrow first! If you need them more than once per year, you might think about getting some. But until them, find a band director friend and do the borrow/trade thing. Next up: celeste. Another instrument you won't play frequently, but you do need to be familiar. One classic example of a place you'll use them is in "The Nutcracker: Dance of the Sugar-Plum Fairy." We played this in college (seemingly) every year, and we had to drag the ol' celeste up from the percussion dungeon to get it done. Here's a WikiPedia article about celeste that is very clear about the origins, mechanics and uses of celeste. Again, before you buy this thing, make sure you really need one - or get a great deal! There are many more pitched and/or keyboard percussion instruments, but they're either really similar to what we've already covered, or they're so rarely used that it's not really worth mentioning them here. *It's worth mentioning that traditional keyboard instruments can fall into the realm of percussion, too. Like piano and harpsichord, although usually percussionists aren't asked to cover those parts. You should, however, do what you can to shore up your piano playing skills. Not only will it prepare you to cover some of these odd instruments, but there is also no better way to work on your sight reading skills than to play piano and learn some new music on a regular basis. Here's a teaser for a post I'll be putting up in the near future. 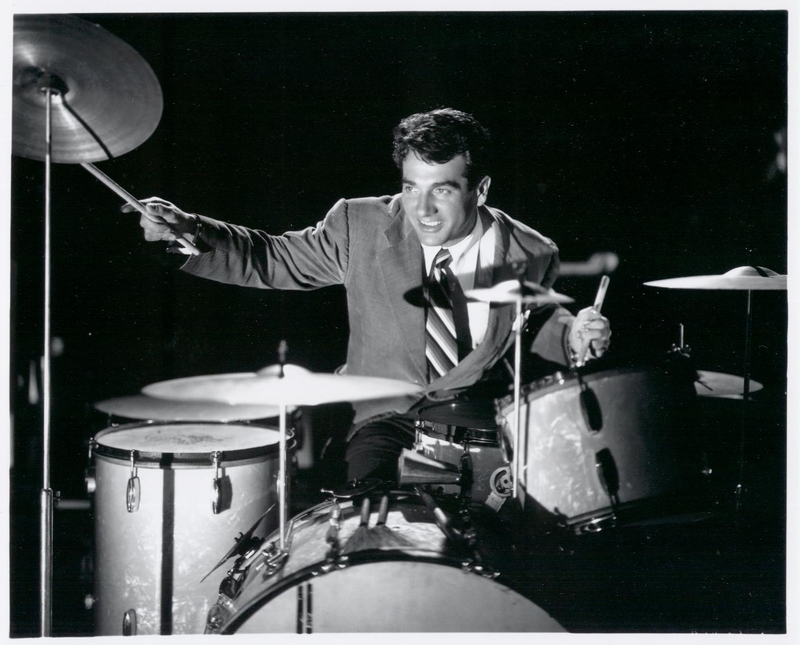 If you're a percussionist in Utah and you don't know this guy, you need to get edjamacated! Finally, we come to the instrument that many of us started on, the "bells." The orchestral instrument is actually called glockenspiel. I have to be honest here. In my opinion, glock is like thai pepper oil: used very sparingly, it is a beautiful thing. But use too much and you're in for some serious pain. In the following clip, the glockenspiel used probably doesn't look like the one you play (or played) at school. It's on it's own frame and has a damping pedal, and it also has more range (more bars) than a standard glock. But the metal bars and the mallets used are just the same. This piece is probably familiar to you, especially if you like Disney! Next, chimes or tubular bells. Truly one of my favorite percussion instruments, and you find them in all types of music. Just a quick look at "Gavorkna Fanfare" by Jack Stamp. Chimes are very present throughout. Chimes also get struck or played usually with a hammer. Hammers are a lot heavier and more awkward than a normal mallet, but it's the weight and the increased surface area that allow the player to get a big, full tone from the chime. It takes some practice, but you can definitely play quick passages on the chimes. I don't know exactly why, but the average non-percussionist thinks that any keyboard instrument is called a xylophone. Personally I get sort of a smug, self-satisfied chuckle out of it when somebody calls my marimba a, "little xylophone thingy," or when someone tries to sell a, "zylaphone" on the local classified ads. Seriously, though. However you say it or spell it, they xylo is AWESOME. With its characteristic bright tone and cutting attack, it is one of the workhorses of the percussion section. Don't believe me? Maybe these folks can help me out. Notice the tone quality difference between the xylophone and the marimbas that are accompanying it. The Thanksgiving holiday has always been one of my favorites. It has always seemed like one of the more relaxed holidays (probably because I'm not the one preparing food), with lots of family around and time to just be. This morning started very early for me (can you say Black Thursday? ), and now that I have a few minutes I thought I'd just list a few of the music-related things I'm most grateful for. First, music itself. From my earliest memories, nothing has had the kind of power in my life that music has. It allows me to feel and express emotions that I can't access in any other way. And even though I love jazz, classical and a hundred other styles and genres, I'm not afraid to say that modern pop music is what touches me the most easily. I think it's the nature of the human voice. Many pop singers aren't formally trained, so the singing is raw, natural and visceral. Also, most pop lyrics aren't all that deep (sorry, friends, it's the truth), which makes them very accessible to the average listener. At the heart of it, music makes me feel. I can't imagine any part of my life without its accompanying soundtrack. I love music. More than I could ever express in words, and that's why I play. That's why I teach, too, to help others to gain access to their own voice. Music is magic. It's life. It connects us to each other. Next, I'm grateful for musicians. Not only the amazing people with whom I get to create and play, but all those who have come before. Music has always been a reflection of the world and of society. Music can be a reaction - or an outright rebellion - to anything, real or perceived, that is going on in the world. And some of the bravest musicians have been those who aren't afraid to challenge the constraints of the times, be they style, subject or vocabulary. Consider this: What is the most abrasive, cutting-edge music you can think of? What do your parents or peers think is too "out there," or unacceptable? Is it metal, rap, country, punk, emo or something else? Remember that almost every style of music that is now "accepted" was once in this category of being strange, forward or unacceptable. Can you even imagine music like Elvis Presley, Duke Ellington or even Mozart being too "hard" for any audience? And yet they were, each in their own time, considered to be pushing the boundaries of appropriateness and acceptability. Don't get me wrong. I don't mean to say that all music will or should be universally accepted. It's worthy of an entirely different discussion, but as a consumer (yup, you are!) or creator of music, you have to consider what the music is doing to you - because it IS doing something to you - and whether that's something you want in your life. But I'm grateful for forward-thinking musicians - even the ones who are abrasive and offensive to me. Because of them, I can create the music that I feel is right and good in the world. My music can make a difference. More so all the time, I'm really grateful for instruments, and those who pioneer and manufacture them. It seems really basic, I know, but the ability to create such a diverse range of sounds with so little effort is such a gift to musicians. Especially in percussion, the sound choices are endless. Size, configuration, materials and construction are very flexible for drums, heads, sticks, cymbals and effects so that every player I've ever met sounded at least a little bit different from each other. I love that I can sound like me, and you can sound like you, and we can both be musicians. Last (at least for today), I'm grateful to have an audience. This probably sounds really self-centered, but who doesn't want to be heard and appreciated? So, whether you're reading this blog or coming to concerts, thanks for listening. You don't have to like it or agree with it. I appreciate that you are attempting to listen and understand. So, happy Thanksgiving, everybody. I sincerely hope that it gives you the opportunity to reflect and reconnect with the people and elements of your life that are the most important and meaningful. And, of course, I hope you have some great tunes in your life today and always. I finally found this on YouTube and had to share. The track is called, "Times Like These," and it's from the Gary Burton and Makoto Ozone album called, "Face to Face." Here's the story: Burton and Ozone came to Salt Lake City's Jazz at the Sheraton series in 2000*. They played this tune at the end of the first set, and when it was done nobody clapped for almost a full minute. It was one of those mesmerizing concert moments where the entire audience somehow recognizes the magic spell that has been cast and realizes that the moment somebody claps it will be broken. When the applause finally started, it was an almost instantaneous standing ovation that lasted for several minutes. The power of music is the music itself. The instrument is just the method of delivery. I hope you enjoy the track as much as I do. Turn it up loud, close your eyes, and let it take you on a journey. *Coincidentally, I attended PASIC later that same year in Dallas, TX, and saw them perform this tune again with the same effect on the audience. It really helped to solidify my respect for GB and MO, as well as my love for percussion and music. A while ago, I posted a basic swing independence exercise. (You can read it here.) Here are two variations on that basic exercise. Again, go slow and get it really locked in, then try it with your favorite swing tunes. Keep the ride pattern prominent so that it feels like swing. Try to make the hi-hat (in 2) and bass drum (in 3) feel like quarter note triplets, with the other instruments filling in the rest of the triplet. Ah, vibes. Such a misunderstood instrument. One thing I neglected to mention earlier (for all you percussion neophytes), is that the keyboard percussion instruments are laid out similar to a piano. They play in concert pitch, and if you already play piano, they look familiar at first glance. You'll have no problem identifying the notes. 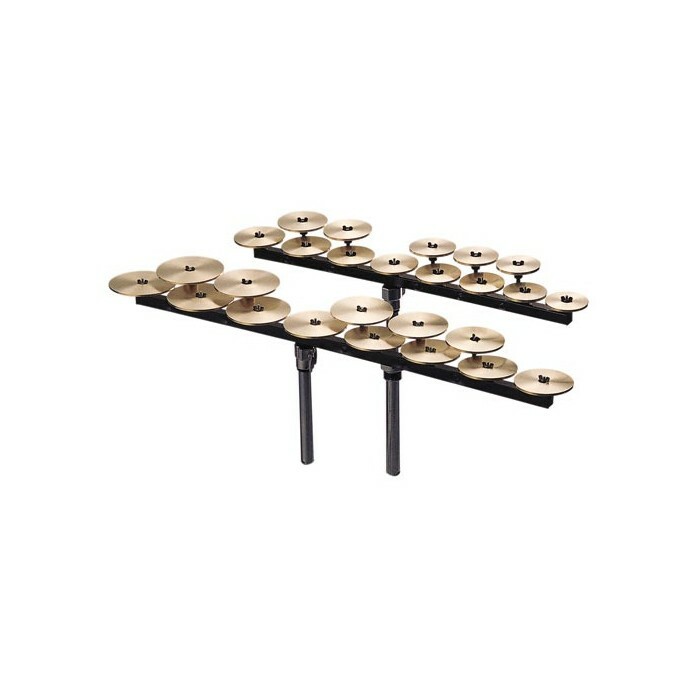 The vibraphone has metal keys and resonators, but also has a fan in each resonator tube that can be turned on to create a vibrato effect - hence the name vibraphone. Most of the time, the fan is left off. It is generally played with a harder, cord-wound mallet. Much like marimba, it's very common to see vibes played with four mallets. And a more contemporary example. And, finally, another Gary Burton clip, but solo this time. Watch the pedal (bottom center of screen) to see how much footwork goes into this type of solo. Also see if you can see "dead" strokes (when he uses the mallet to both play and dampen a bar at the same time) and silent strokes, called "mallet dampening." Gary is easily the foremost vibe player of all time, in addition to being a great composer. In junior high, as beginners, we called them, "bells." Anything where you had to play actual pitches that wasn't timpani was bells, and only the weird kids played them. Well, call me a weird kid. My favorite percussion instrument is marimba. There are actually quite a few mallet instruments in the percussion family. Allow me to list the most common (and a few that aren't so common). First, marimba. 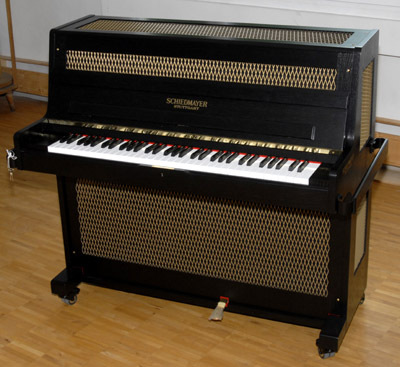 This is the largest of the keyboard instruments. The keys are usually made of rosewood, although some man-made materials (such as 'kelon' and 'acoustalon') and other woods (such as padouk) have been used to make the instrument a little more affordable. Marimba is played frequently with four or more mallets, and usually by soloists or in percussion-only groups. The amount of literature available for solo marimba has exploded in the last ten years, and it is considered to be one of the basic percussion instruments that every student must learn. It is also starting to be more commonly used in band and even orchestral music. There is no way I can give even a cursory introduction to marimba in one blog post, so I'll just give you a little taste and let you explore away. And even if you're already familiar with the instrument, here are a couple of my favorite players. And another, young marimbist and master percussionist, Casey Cangelosi, also a colleague of mine. He and I did our undergrad work together at Utah State University under the direction of Dr. Dennis D. Griffin. As you can see, Casey has gone to other worlds. Enjoy! While I'm at it, I can't leave this one out. This was the 2009 Blue Sky Faculty Jam/Concert at Westminster, and the first time I'd ever met Ryan Tilby. This performance left me speechless. Keep in mind that this was recorded on somebody's cell phone. Thank you, Aaron and Ryan. For best results - seriously - put on some great headphones or the best speakers you can find, and turn it up LOUD. Occasionally I have the privilege of playing with the Aaron Ashton Band. Check him out here. These videos are from a gig we played in July 2011 as part of Blue Sky Music Camps. Featured in this video are (from your left to right): Sam Runolfson - Cello, Kendra Lowe - Keyboard/violin/banjo, Aaron Ashton - Violin, me, Ryan Tilby - Bass and Austin Weyand - Guitar. Easily the most talented band I've ever played with. Also worth noting is that this was an audience of maybe 80 people, and they were LOUD and friendly. Awesome night! The audio isn't as good on the next one, but it's one of my favorite tunes to play with Aaron. The new Lokalgrown promo video is finally done. Please check it out! On Friday, November 11 and Saturday, November 12, I will be playing in the percussion section of the American Festival Orchestra and Chorus. We are performing Benjamin Britten's "War Requiem." This is a very challenging piece, and is considered to be one of the true masterworks of the 20th century. And, although this is for a different performance, the video below will give you a better idea of what you're in for if you come. Hope to see you there! These days, I like to think of myself as a musician who happens to also play percussion. Because music is created in so many different ways by so many different instruments, we should put the music first and the instrument second. So, to introduce the first area I'll focus on, two of my fave marimbists playing one of my favorite pieces. *Why not all six, you ask? 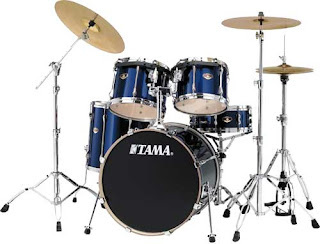 Because drum set is one of the six, and I spend most of my time on this blog talking about and exploring drum set. I'll be giving only a brief overview of the others at this time. I don't have any awesome pictures yet, but last night's Utah Wind Symphony concert with Larry Zalkind, principal trombonist of the Utah Symphony Orchestra, was fabulous. Most of my parts were chimes, and I also played some bass drum, triangle, marimba, xylophone, and exactly four snare drum notes. Awesome! The UWS is a rare group on the wind band front, and if you get the chance, you need to check it out. Hope to see you at a future concert. The highlight of the evening for me was "Sunrise at Angel's Gate."